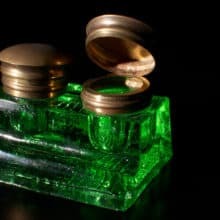 Green Fountain Pen Ink is today’s blog post. I’ve recently decided to look for a green ink for my fountain pens to use with my letter writing adding to my go-to-colors of ink. In my quest to find a green fountain pen ink wanted to highlight these four items that stood out from the many items I looked at online. My format for today’s daily blog post is a little different as it is in list format. Be sure to check out the recent article at JetPens.com with their Dark Green and Dark Teal Fountain Pen Ink Comparison. The March 1st article is a must-see & read if like me you are wanting to know more about what is available and how they compare. This video of a Melon Green color is a little over one minute to watch. 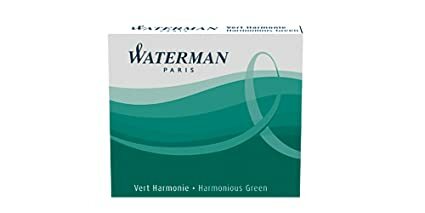 And for the final item – there is Harmonious Green by Waterman which I’m going to be adding the mini ink cartridges for ease of use with several of my converter fountain pens. Thank you for joining me today and have fun expanding your current fountain pen ink colors. If you don’t have a fountain pen have fun considering adding one for your letter writing – and if you do already have a fountain pen think about adding another one!